Let’s face it, Christmas parties can be boring and cheesy. The dreaded company staff party comes to mind. Christmas carols and Santa hats are great for kids, but they aren’t going to satisfy your adult guests. 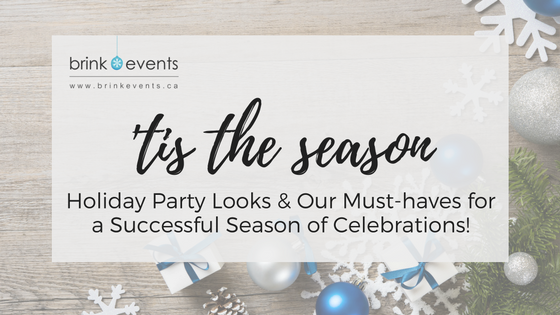 A foundation of great food, beverage, and entertainment is a great start, but how do you take your party to the next level? A sophisticated Christmas theme can add an elegant touch and engage your guests. The cold whisper of the winter wind… The glistening icicles that hang from the eaves… An icy cold theme with a crisp blue accent can create a frigid, yet comforting environment. 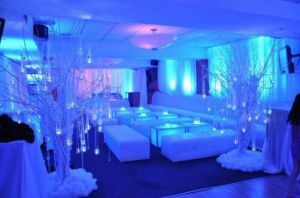 Blue uplighting is a simple and easy way to completely transform a room on a conservative budget. Tabletop decor and floral can top off this wonderful theme. Budget permitting, an ice bar or ice luge could create a remarkable moment that your guests won’t soon forget. No colour or shade is more elegant and pure than white. Such a simple idea can provide a glorious backdrop for holiday festivities. Adorn your room with fake snow or bring in a full-sized snow-covered Christmas tree as a focal point. 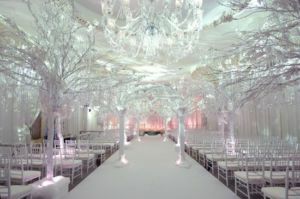 Dress the room with white decorations and continue the theme into your food and beverage offerings. Perhaps a mashed potato bar serving up a martini glass of snow-coloured spuds with a wide variety of toppings? Spice up your holiday theme with a red hot colour palette. From lighting to decor to a party dress code, be creative when it comes to this fiery theme. Though it may be cold outside, firing up your party just may be the ticket. Candles are a tasteful and exquisite way to provide warmth – think all shapes and sizes. 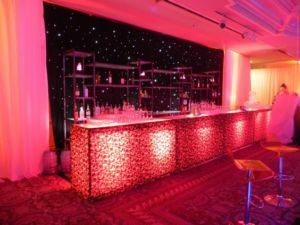 Your linens and event visuals may also provide avenues to bring the heat. A splash of cinnamon or peppermint anyone? We’re not necessarily recommending Fireball, but hey… maybe? The lush smell of pine… and you’re thinking gin, right? We may be as well, but that’s beside the point. 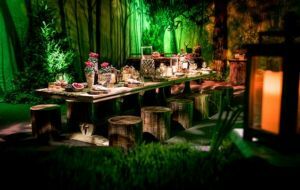 A beautifully decorated room with lush greenery, branches, shrubs, and trees can create that whimsical forest backdrop that you only read about in fairy-tales. An enchanting winter woodland awaits, so be creative and bring on the ‘green’! Add additional scent to the room and don’t be afraid to transition the theme into the food. With such a wide variety of local and sustainable offerings, you’re sure to be able to produce a menu with delicious foliage and original presentation. Satisfy your sweet tooth with a medley of holiday treats. From candy canes to snowman-shaped chocolates, you can even bring on dessert! How about gingerbread or other baked goods? The options are endless and so are the calories. But the holidays are a time to enjoy yourself and indulge in your favourite treats. So be sure to treat yourself… and your guests. 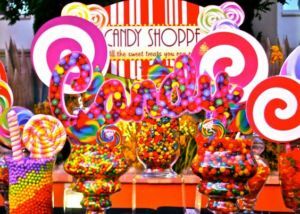 Candy shouldn’t be your only food option, but it should be the star of the show! PS. A candy cane makes a great cocktail garnish. This post was written by Aidan Henry, Founder and Creative Director at Brink Events.